At 292 pounds, my hurting, swollen, lumbering legs barely worked. I spent $850.00 on orthotics to enable me to walk. It was hard to move around and I had no energy. My back killed me, and I could hardly breathe. I was always tired. I took 600 mg of Ibuprofen, 4 times a day for five years, just to deal with the arthritis in my spine. I only went to church, to the store, to work and out to eat with my husband. I wasn’t involved with my 10-year-old son’s life because I was in pain. I stayed in “safe places” because of my physical limitations. Every time I looked in the mirror I saw failure. I would try, lose, regain, try, lose, regain – over and over and over – until I surrendered to fat. I hated myself and was ashamed. In all I recall some 35 attempts at weight loss. Looking back, the amount of weight I needed to lose seemed insurmountable! I knew that even if I lost 40 pounds I’d still be left with 80 pounds extra. I would never be successful just dieting to health. My son is the reason I began this journey. He rented a movie about a severely obese mother who dies in her bed. And rather than have a crane lift her out, the children burned down the house to save her from humiliation. I wept. I thought he was trying to tell me something but didn’t want to hurt me. That Sunday the paper came and a Barix ad was in it. I read and re-read and re-read, but I was afraid to call. Then a Barix TV commercial caught my eye. I was sitting in a recliner taking a nap and I woke up just as it came on. Tears welled up in my eyes, my heart raced. I reached for the phone and called Barix right then. I chose Barix because it looked so professional & the ads SAID what I FELT! The rest is history… the rest is Future! From the consultation to the surgery, everything about my experience was A-plus. I believed I was trusting my body, my health, my very life into very capable hands. I was treated with compassion. They guided me through the entire process with professional courtesy, honor and respect. I cannot thank Barix enough for the new life they so capably handed over to me. On September 6, 2001 my life changed forever. It was given back to me in the form of a Roux-en-Y procedure at the Barix Clinics in Belvidere, IL. Losing 130 pounds has given me NEW LIFE! While on a hike with my 10-year-old son, he hurt his ankle. With a half mile of trail left, I carried his 105 pounds piggy-back. Each step was a struggle. My legs felt like concrete walking through tar. My back and feet ached with each step. I was breathing hard, and my heart was pounding. Then I had a “light bulb” moment. I realized that before the surgery I carried my son’s weight plus 20 more pounds every day of my life for 20 years! I am so alive! I breathe strongly. I am active, vibrant, and full of energy! I have not taken a single Ibuprofen tablet since surgery. I don’t take anything for the arthritis in my spine! Since losing the excess weight I have no pain! I sleep 6-8 hours with no back pain! No foot pain! I am so healthy! 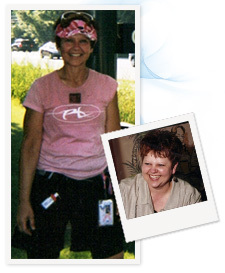 Bariatric surgery is the tool that gave me back my self-esteem. It gave me back my life. Now I share MY life for others! Why, you ask, would a 51 year old mother and grandmother walk 60 miles in 3 days? Because now I can! This is my 4th year walking the Breast Cancer 3-Day. My body is a walking machine! I no longer sit on the sidelines as an obese "observer” and cheerleader" for others. I've become a PARTICIPANT in life! I cannot fully express in words the enormous gift I live every day. I do not take this for granted. I am free to participate. Free to breathe. I am FREE!